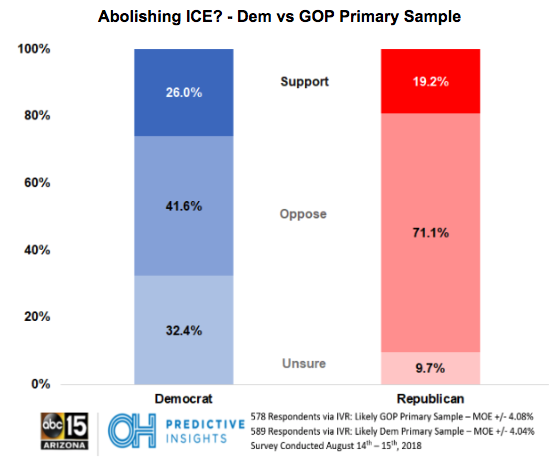 PHOENIX (August 20, 2018) – The last two polls from OH Predictive Insights show that there are some commonalities between Republicans and Democrats - they don’t support abolishing ICE. OH Predictive Insights and ABC15 Arizona (OHPI/ABC15) teamed up to find out the support or opposition for abolishing ICE. OHPI conducted two separate surveys: One for a likely 2018 GOP Primary sample and another with a likely 2018 Democratic Primary sample. Both asked the same question: Do you support or oppose abolishing ICE?